The newly-renovated hotel features numerous interior and exterior updates Â– an investment of more than $20 million over the past 18 months. Furthermore, an additional $8 million renovation to the property will improve the quality of guest experiences during their stay. The DoubleTree by Hilton Montreal opened yesterday at 1255 Jeanne-Mance Street. The 20-story, 595-room hotel joins the DoubleTree by Hilton global portfolio of more than 540 hotels, and continues to enhance its existing offerings to provide top service to its guests. The newly-renovated hotel features numerous interior and exterior updates – an investment of more than $20 million over the past 18 months. Furthermore, an additional $8 million renovation to the property will improve the quality of guest experiences during their stay. 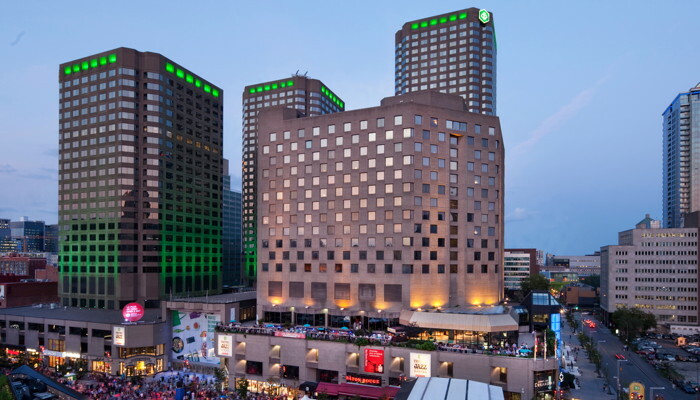 "With location in the heart of the Quartier des Spectacles, Montreal's entertainment district, this investment aims to optimize the hotel's role in the neighborhood, as well as reflect the spirit of the district within its walls," said Bernard Chênevert, general manager, DoubleTree by Hilton Montreal. "Montreal's Quartier des Spectacles is internationally renowned, and we believe this hotel is one of the city's best kept secrets here. These renovations will provide a place for our guests to fully enjoy the beautiful city of Montreal."